A rowing boat arrived at Loch Shiel on the afternoon of 19th August 1745, carrying a determined young man, known as ‘Bonnie Prince Charlie’ preparing to fight for the Stuarts’ cause, and his father’s right to the thrones of both Scotland and England. 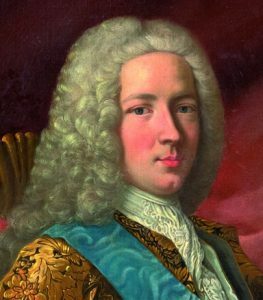 The young Prince, Charles Edward Stuart, was met there by fifty of his followers from the MacDonald Clan, in response to the letters that he had sent all over the Highlands, asking for support. The initial disappointment at the poor response to his request was soon lifted when around a further one hundred and fifty MacDonalds arrived. They were then joined by around 1,000 men from the Clan Cameron who arrived on the scene, and three hundred Macdonnells, who had been held up after being involved in battle with some Government troops at Spean Bridge. Bonnie Prince Charlie was now ready. His standard was raised on the exact spot where Glenfinnan Monument now stands, and the 1745 Jacobite Rising, the valiant attempt to reinstate the exiled Stuarts to the throne, was now under way. Charles Edward was born in Rome, in 1720, grandson of King James VII of Scotland and II of England, a Catholic who was deposed by Parliament in favour of William of Orange, at a time when the Protestant religion was being adopted by many. His father was “The Old Pretender” James Stuart, who had seen two previous attempts to seize the throne end in failure, the first of which was in 1689. Some of the surviving MacDonalds from that uprising would become victims of the infamous Glencoe Massacre in 1692. Charlie was also to fail. He invaded England as far as Derby, but had to retreat due to lack of support from England and France. His last attempt was at the Battle of Culloden on 16th April 1746, when he was defeated by government forces, and he became a fugitive. While on the run, he met Flora MacDonald on the island of Benbecula, and despite the fact that her foster father was in command of the Government troops on the island, she agreed to help Charlie escape. Flora smuggled him to the Isle of Skye, disguised as her maid, and from there he made his way to France. He eventually settled in Rome, now an alcoholic, and saw out his years with many failed relationships. The Young Pretender died on 31st January 1788, and with him died the Stuarts’ aspirations to regain the crown. He could probably be described as a lovable rogue, but nonetheless he has rightly earned his place in Scottish history. Flora was imprisoned in the Tower of London for a short time for her role in his escape, and the story goes that Charlie and Flora MacDonald had fallen in love. Following her release, her part in the escape made her a celebrity. Flora died in 1790, and was buried on the Isle of Skye. Legend has it that she asked to be buried wrapped in Prince Charlie’s bed sheet. The Glenfinnan Monument was erected by Alexander Macdonald in 1815, to mark the spot where Bonnie Prince Charlie had rallied his troops and raised his standard to signify the beginning of the 1745 Jacobite Rising. 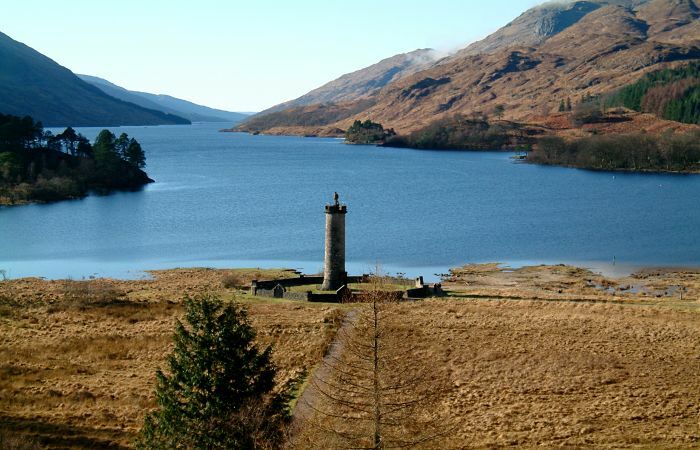 Situated at Loch Shiel, about 18 miles west of Fort William, this monument is a popular visitor attraction, in a picturesque setting, surrounded by mountains and woodlands. Cruises are available on the loch from March to October. You can also access good cycling routes, enjoy the panoramic views and spot some of Scotlands’ wildlife. 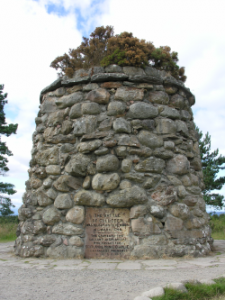 The monument has a shop, snack bar, and visitor centre with displays, and features an audio programme about the campaign from Glenfinnan to Derby, and back to the final defeat at the historic Battle of Culloden Moor (last battle to take place on British soil).